I borrowed the book Cooking: A Commonsense Guide from the library while waiting for my container load of cookbooks to arrive from the UK. 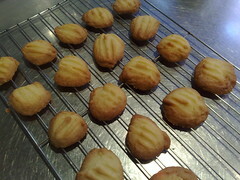 The book is full of sensible, familiar recipes so I was, obviously, going to try out some sensible familiar biscuits! The recipe alleges it makes 40 biscuits so I decided to reduce measures by a half: after all, 40 biscuits is quite a lot for anyone for afternoon tea (and I only had about 100g of butter). This recipe is given two ‘saucepans’ (the book’s way of grading difficulty) – thus requiring “a little more care and time”. Thanks to the power of the Magimix, this recipe quickly becomes within the grasp of the nervous baker. I did not have a piping bag and fluted nozzle, so my biscuits were just generous teaspoon sized blobs, slightly flattened with a damp fork. These are very quick to put together and use store cupboard standards, so this is an ideal recipe if you ever find yourself in a biscuit emergency (and yes, such a thing does exist). Preheat oven to 180C. Line a baking tray with baking paper. If using a food processor, beat butter, sugar and vanilla essence together until light and fluffy. Add cornflour (if doing this by hand, sift the cornflour first) and mix until just combined. The mixture will be quite stiff. Spoon (or pipe) onto the baking sheet. Top with topping of choice (or leave plain) and bake at 15 minutes, until lightly golden and crisp. Leave to cool on wire rack. Be aware that, when hot, the biscuits will be very fragile. Even after they’ve cooled, they are very short so plates may well be the order of the day. Cooking: A Commonsense Guide is available from Fishpond for $AU28.97, from Amazon UK for £6.53 and from Amazon US , used from just 44c!